In 21st century, the communication game is seeing all time high with hundreds of social media apps attracting not only millennials but generations before. 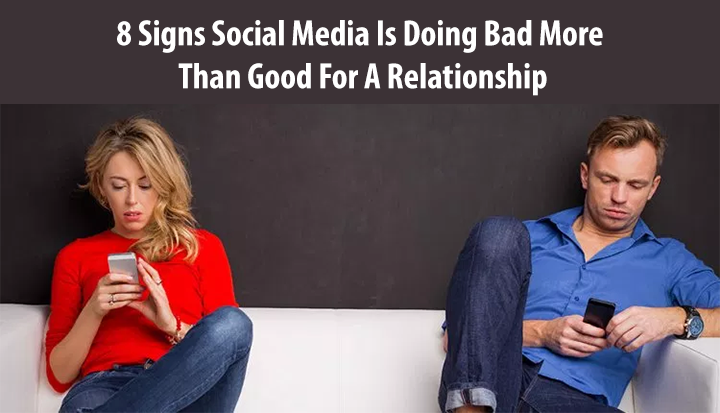 Despite the fact that accessibility becomes easy to stay connected, there’s just no denying that social media dramatically alters the nature of relationships and the need of being socially connected. In short, relationships are so much easier yet more complicated. A big question makes us wonder on the efficacy of social media in our lives, if social media is doing bad more than good for relationships? 1. Relationship status, “It’s Complicated”. This strange relationship status can raise a lot of questions when in reality you two are sound and happy together, but your partner’s “it’s complicated” makes you worry. It’s both irritating and confusing, since your partner keeps telling you that you’re official and that you’re both in a committed relationship yet, this status denies their story. 2. Cozying up pictures of your partner with other female friends. You want to keep a healthy relationship but as much as you want it to be, you also get suspicious of your partner’s acts with other female friends. 3. Passive-aggressive feuds with Tweets and Facebook posts makes him appear immature. Pointless debates and immature fighting on social media are for the people who have nothing else to do with their time. This could bother you in the long run so, you need to talk to your partner if they engage in passive-aggressive statuses and tweets that are taking legitimate aim at a particular person. 4. Bragging on social media. Social awareness in a person gives an impression that education woke up some good in that person. There is nothing wrong if you share it on social media to bring other people on board. But there is no meaning of bragging it on social media just to gain fame, it kills the essence of your good action than a virtue done in disguise. 5. It is used for sexual forms of communication. Now, this is alarming in your relationship if your partner is asking for your nudes. There are different ways to get intimate but using social media for sexual forms of communications is inherently wrong. 6. You are not in the picture. Literally, if you can’t find yourself in your partner’s profile, posts, and pictures then you need to think, are you really even together? Social media is used to share the important things and events in our lives but if you don’t even see a single picture of yourself on your partner’s profile then you need to consider your relationship seriously. 7. Your partner broadcasts personal problems on social media. You wonder, if your partner is really sane ranting about personal problems on social media when you never know it might become a subject for a Facebook post. This is a disadvantage rather than any good for your relationship. Your partner’s social posts from the first minute after waking up to the last minute before sleep make you worry if they have anything else going on in their lives.